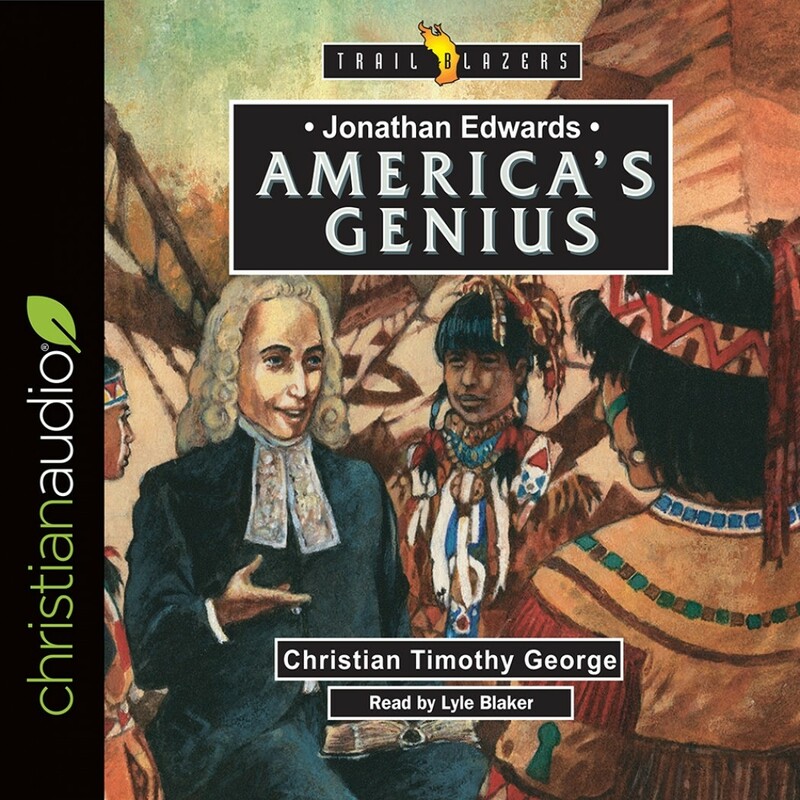 Jonathan Edwards: America's Genius | Christian Timothy George | Audiobook Download - Christian audiobooks. Try us free. A good, first-time biography. Great for young readers. More of a teaser to JE's life. Beyond a very truncated look at his life, this book would help those interested to read much longer, more in depth, biography on this man. Fun read, with good historical information. Engaging, easy to follow along, all the while introducing you to one of the church's most useful men, and showing you the Glory of God in the life of such a man. I listened to this short audio-book (from ChristianAudio.com) while waiting for a recent flight, and only sort of enjoyed it. While it covers some of the major events in the life of Jonathan Edwards, it's not enough for a reader to really come to know the man. It's more a book of fictionalized anecdotes than a biography, so prepare yourself for an interesting distraction more than an education when you read it. The story starts with Jonathan running through the woods with his sisters and finding himself fascinated by the spiders who live their quiet lives away from human eyes. That Jonathan loved nature is no secret (which is one reason I'm becoming more interested in him! ), and that he used aspects of nature as illustrations in his sermons is most famously displayed in his masterful sermon, "Sinners in the Hands of an Angry God." I'd like to read more of his sermons to see how else he utilizes his knowledge of the natural world to display God's glory to his hearers. Several characteristics of this book make it one I'll not read again. The anecdotes chosen for this book (and then fictionalized with thoughts, emotions, and dialogue) seem disjointed at times. Perhaps author Christian George desired to provide a fresh look at a man whose biographies are many, and if so, I guess he's dealt us something unique. I'm just not sure who his intended audience might be. Children? Teens? Certainly not those already familiar with Church History, as this is a poor biographical sketch of someone already familiar to us. I also must take issue with the title. While the book touches on Edwards' vast mental capacities, its title "America's Genius" doesn't really fit. Jonathan Edwards might have been a genius, but that's not why we remember him and that's not the point of this book. If the author has only copied a title that others had given to Edwards (I'm unsure), then my apologies. If you're looking for a quick diversion into the life of a famous preacher, this book might be for you. Otherwise I'd suggest you seek out more well-established biographies by stronger biographers. Fascinating, illuminating and well worth the listen! Great stories and great truths about Jonathan Edwards and the God he served. I knew relatively little apart from a couple famous sermons, so this book was a treasure. I especially appreciated the accounts of the family's life in and among American Indian tribes in Massachusetts. That was entirely unknown to me, and illustrated Jonathan's humility and kindness. There's nothing that drives me more crazy than reading/listening to a book that's supposed to be a biography where the characters are quoted as if the conversations were real. I would characterize this book as biographical fiction. Good biography for kids, Also interesting for adults. Well read. Delight to hear. Great introduction to a man who I only knew of by name before reading this. I liked this so much I listened to it twice over the course of this month! I found this book to be very interesting and well written. I was unfamiliar with Jonathan Edwards' life before reading this and I found it very informative and inspiring. I would recommend this to anyone.